THE GIVETH PART: The Property Tax Extension Limitation Law (PTELL) is designed to limit the increases in property tax extensions (total taxes billed) for non-home rule taxing districts. Although the law is commonly called “tax caps,” the PTELL does not cap either individual property tax bills or individual property tax assessments, it only slows the growth of revenues to taxing districts when property values and assessments are increasing faster than the rate of inflation. As a result, property owners have some protection from tax bills that increase only because the market value of their property is rising rapidly. Increases in property tax extensions are limited to the lesser of 5% or the increase in the national Consumer Price Index (CPI) for the year preceding the levy year. The limitation can be increased for a taxing body with voter approval. PTELL made sense in the 1990’s and early 2000’s, when people were buying McMansions on the expectation that there was nowhere to go but up. But when the bubble burst, as all bubbles must, and property values plummeted, they found that their real estate taxes didn’t decline as a result. PTELL is of absolutely no use in a declining market. THE TAKETH AWAY PART: With the advent of the PTELL, a new component was added to the state aid formula: a specialized formula adjustment intended to offset the impact on school districts whose revenues from local property taxes were restricted. The theory was that school districts should not be punished simply because the real value of property in the district was climbing faster than allowed under the tax caps. The subsidy replaces what the districts with growth would have generated locally had they not been limited by the PTELL, and has grown from just $ 46 million in 2000 to $ 780 million in 2009 and then fell with declining home values to $ 629 million in 2012, an increase of 1,267%. PTELL adjustments have particularly benefited Chicago Public Schools, which enrolls 18% of students, but receives 49% of PTELL dollars. As a result of these programs, Chicago has seen its education property tax rate drop from $3.60 per $100 of equalized assessed valuation (EAV) in 2001 to $2.37 in 2009 (the latest year available). The $2.37 tax rate for Chicago compares with rates of $3 to $6 per $100 of EAV in school districts elsewhere in Illinois. Like every property in Illinois outside of Cook County, this property with an assessed fair market value of $255,360 is assessed at 33-1/3% of fair market value, resulting in a 2014 tax bill of over $8,500. Notice that the property is assessed at 10% of fair market value, and the total tax bill for 2014 is just under $4,400. I don’t want to beat up on Chicago, especially since I know the guy who owns the property shown above. 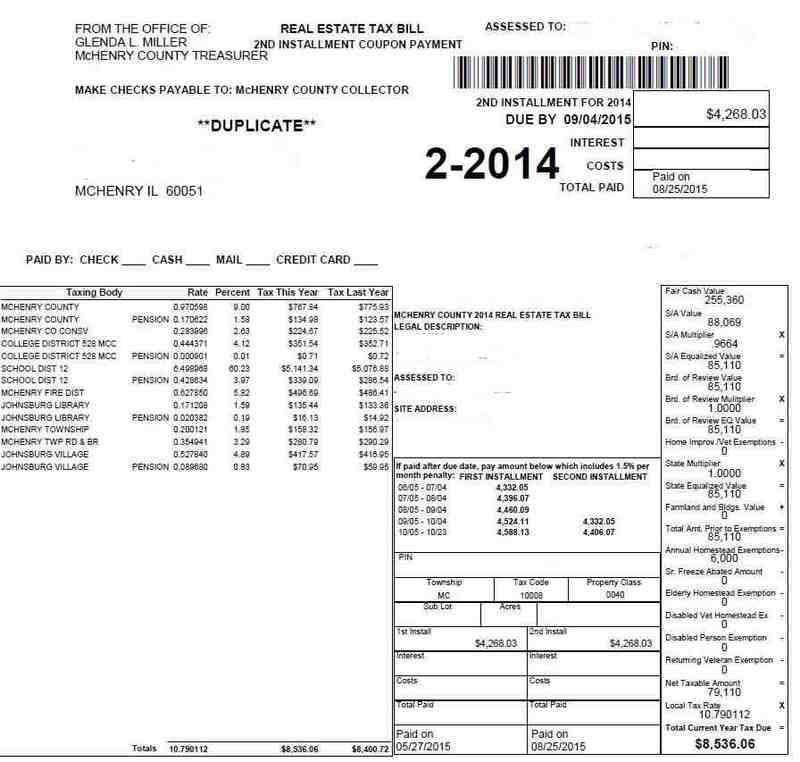 But, when Chicago assesses its residential property at 10% and the taxpayer in McHenry County is assessed at a third of fair market value, when taxes on a property in McHenry is almost twice what my friend in Chicago pays, why is it that Chicago gets the benefit of any of the PTELL subsidy, let alone almost half? NEXT: Why do the poverty grant and PTELL subsidy matter? 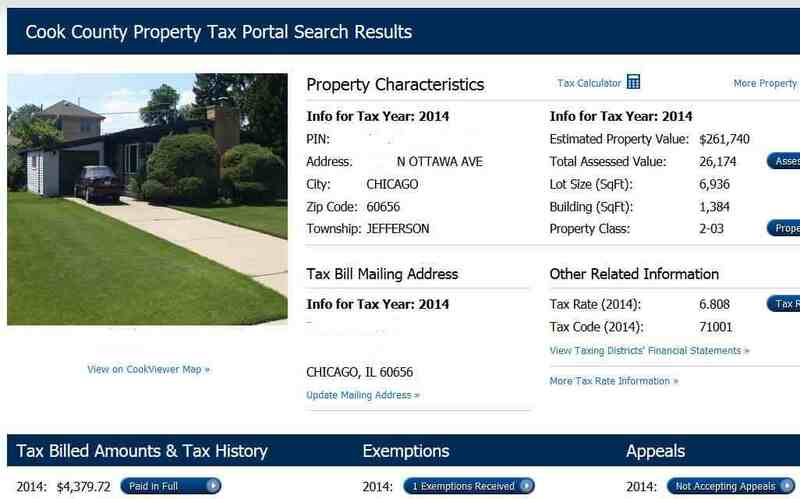 This entry was posted in Education, Property Taxes and tagged Chicago Public Schools, Education Funding, PTELL. Bookmark the permalink.